Halloween is a fun time for both kids and adults; however, before you can set the mood, you'll need a couple of decorations that are appropriately themed. While there’s an endless selection of Halloween décor pieces available for purchase online, it's highly advisable that you check out the inflatables ones. As the name suggests, Halloween inflatables are decorations that require air to inflate and take their full shapes. The great thing about inflatables is they offer a lot of visual impact while requiring minimal effort. Typically, inflatables will already come with an internal fan. You only need to plug an inflatable into an outlet, and it will inflate itself. After Halloween, you can deflate it, and it's easy to store because it doesn't consume a lot of space. Halloween inflatables also come in many styles, sizes, and shapes. To make things less confusing for you, this article compiles some of the best Halloween inflatables at the moment. 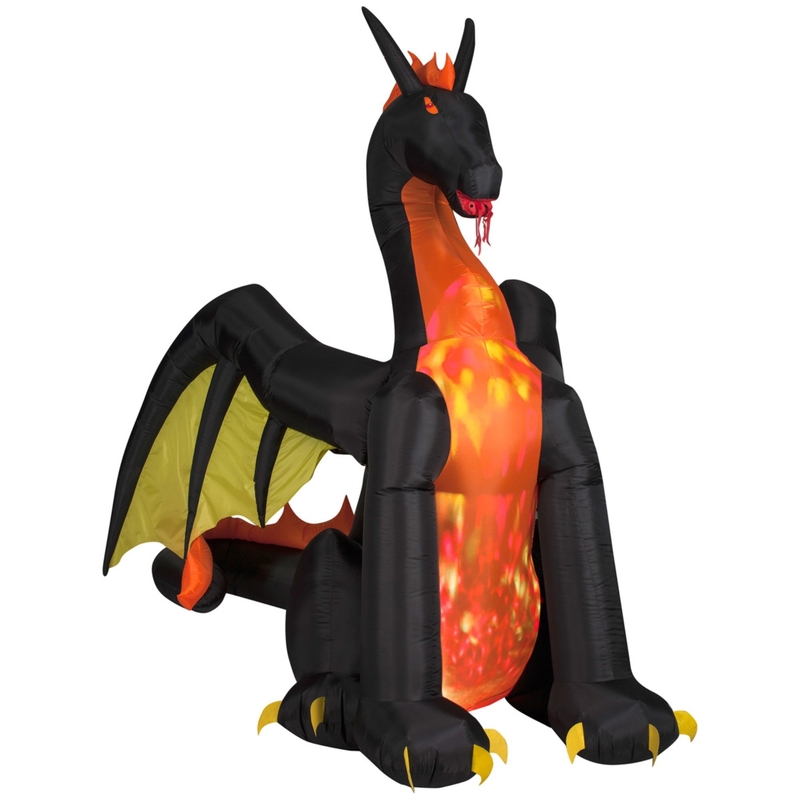 With this dragon inflatable, you can have a scary Halloween setting without having to invest a lot of effort. After all, there are only a few things that are scarier than a black fire-breathing dragon. This is more than just an inflatable dragon. It's an animated one as it is capable of flapping its wings. Additionally, it can light up with terrifying red and yellow lights. It's a dragon waiting for someone to roast with its fire. Despite having lights and an animated setup, the product is very easy to set up. You only need to pump air, plug it into a 120-volt outlet, and it's ready to scare children of all ages. After use, you can merely deflate it and place it in storage until the next Halloween! If you're tired of the old Grim Reaper design for the Halloween, then this one will surely spice up your place. This inflatable not only features the Grim Reaper, but it also sits on a carriage of death pulled by an eerie horse with scary eyes. Aside from the eye-popping setup, this inflatable comes with internal lights which make it more exciting while being terrifying at the same time. The item is crafted from weather-resistant polyester. Thus, you can freely use it in an indoor or outdoor setting. The product is effortless to set up as it self-inflates. It also deflates and folds neatly so you can easily store it after the Halloween season. With such a grand design, this Grim Reaper decor can readily become the highlight of your entire Halloween setup. This Halloween inflatable is unique. It comes with a fun vibe but still features a headless horseman. The horseman is carrying his head, which is a pumpkin with a big smile. It's a great Halloween addition if you don't want the setup to be too terrifying for the kids. The item comes with internal lights, which makes the product more interesting. The lights also allow it to be a perfect nighttime Halloween decor. It comes with an internal fan so it can self-inflate. The product is complete with everything you need to set this Halloween decor. It comes with tethers and stakes. It's also easy to set-up that anyone can do it. If you want a Halloween decor that comes with a "party" vibe, then this one may be perfect for you. It features a skull decorated with two spiders in orange and yellow color. It's both spooky and fun. To further enhance the decor's party vibe, it features internal lights that projects in a kaleidoscope of colors. Furthermore, the lights swirl to make it even more entertaining. The entire decor is self-inflating, so it's effortless to set up. The package also comes with tethers and lawn stakes to ensure that you're cool decor stays in place. After Halloween, the item deflates easily. Since it collapses and folds, you can store it almost anywhere. Why go for a decor with a single pumpkin, when you can have three? This cheerful Halloween decor features three pumpkins on top of each other. It's a perfect addition if you want something that carries a bit more of the "fun" rather than being on the scary side. With its vertical profile, it's perfect for the lawn, by the door or beside the fireplace. Because it does not consume too much space, you can almost place it anywhere you like. This Halloween inflatable comes with internal lights. It's not only more interesting, but it's perfect for a dark or nighttime setting. Crafted from weather-resistant polyester, it can sit comfortably indoors or outdoors. The decor is easy to use as it's self-inflatable. It can deflate to a tiny size when deflated, making it easy to store just about anywhere. If you are looking for a Halloween addition for your driveway or pathway, then look no further. This item features five tombstones with a funny skeleton. Most importantly, it's arranged side-by-side making it a perfect addition for the pathway of the front or backyard. It also comes with lights which can serve a dual purpose. The lights make the item more fun to look at while also lighting the way for your guests. The entire decor is inflatable, which means it's easy to set up. Furthermore, it's self-inflating. You only need to plug it into an outlet, and it will take care of itself. The product is also crafted from a lightweight material, which means it's to handle and operate. During the Halloween, it's the skeletons, pumpkins and the bats that get all of the attention. But what about Mr, Frankenstein? If you think Frankie deserves the attention too, then you'll love this Halloween inflatable. This inflatable features Mr. Frankie in a purple shirt. Since it's Halloween, he didn't forget his pumpkin bag to store all of his trick-or-treat loot. Mr. Frankie also carries a big smile to welcome all of your guests. It's a perfect Halloween decor for the kids because it's not terrifying. The inflatable also comes with internal lights. Thus, it's an excellent lawn decor during the night. The item is inflatable which means it's very easy to set up. It also deflates to a very small size so you can store it easily. There are too many Halloween decors that are terrifying for the children. While scary decors might be fun for the adults, but it often horrifies the little ones. You really don't want to see crying kids when Halloween is supposed to be a fun time for the boys and girls. Thankfully, you have this cheerful Halloween decor. This inflatable features a tree, a ghost, an owl, and pumpkins. Most importantly, it's a delightful scene as almost every character is smiling. With this inflatable, you have a Halloween decor that's perfect for the occasion while not terrifying for the little ones. The package already includes everything you need to set up the inflatable, including ground spikes and tethers. Also, it comes with internal lights and an internal fan. So you bought a couple of Halloween decors for the insides of your house. However, what about the outside? Thankfully, you can get this "pumpkin-filled" Halloween decoration. This inflatable features seven pumpkins arranged from side-to-side (more or less). Most importantly, it comes with internal lights making it a perfect decoration for the pathway. Not only the cheerful pumpkins will greet your guests, but they also help by illuminating the way. Of course, you can also place it inside the home if you think your setup could use more Halloween decorations. The item is crafted from a weather-resistant polyester material. This means you can place it outdoors, specifically on the lawn. The great thing about this inflatable is the pumpkins are all cheerful. It won't scare the kids to tears, which is often the case with terrifying-looking decorations. This item features a stack of three pumpkins. Since pumpkins are synonymous with Halloween, it's an inflatable that will fit well to any kind of theme or design you are going for. The item comes with a tower-like profile, which means it doesn't consume a lot of space. You can place it in the corner of the room, beside the sofa or at the entrance of your home. In fact, it's a perfect decor to place in the pathway as it comes with LED lights. It can help illuminate the way while being an excellent Halloween addition. The item is straightforward to set up as it's self-inflating. It's constructed from plastic (20%), metal (20%), and fabric (60%). It's strong enough to be placed in an outdoor setting.